Formed in 2015 to provide the latest Financial Transaction delivery Technology at an affordable cost. The Mission of Automated Transaction delivery is to enable financial intuitions to overcome the challenges of consumer migration to convenient service models and reduce the traditional operational costs. We accomplish this by using the latest technology, which is cloud based central server capability combined with the flexibility of current secure wireless communications. The integration of these technologies delivers the best value available for financial intuitions today. Our technology allows for no upfront product development investment and a low fixed monthly transition delivery fee. The transaction delivery fee is then offset by all the transactional revenue generated thru ATM based self-service transactions. We reduce transactional costs with the latest delivery enabling technology. A traditional teller delivered transaction averages $1.60 per transaction. 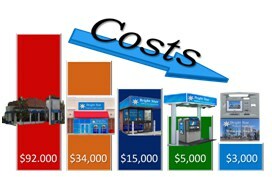 Teller cash recycling technology reduces this cost to an average of $1.10 per transaction. Assisted self-service solutions delivering with 70% self-service and allowing for personal service where needed averages $.54 per transaction. Self-service technology deposit automated devices averaging $.32 per transaction and cash deliver averaging $,29 per transaction. 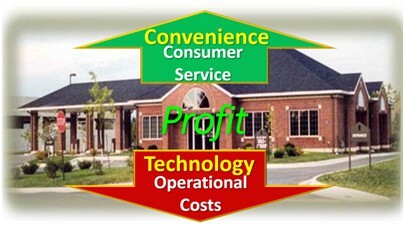 We reduce consumer service costs by introducing smaller technology enabler consumer service. If for comparison, we look at the costs of consumer service over a 5 year term the results are notable. The traditional Branch and Teller method costs an average of $92,000 per month. 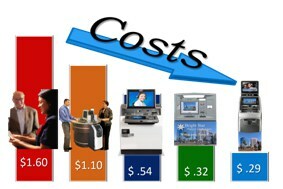 Using a small technology enabled branch reduces this cost to $34,000 per month. An assisted self-service kiosk averages 15,000 per month with a dive up standalone island location averaging $5000 per month. A Self Service only, deposit automation enabled device averages $3,000 per month.